Nothing I have ever done in the course of my life has generated more enmity among the wives of quality-conscious Bible readers than my original review of the Allan's ESV in black goatskin. As a result of that little essay, countless people have learned firsthand the devastating effects of a weak dollar, and many more have promised themselves to take a trip some day to the Glaswegian promised land where R. L. Allan's is to be found. No doubt they have also hardened their hearts to the plight of the "highland goat," which must by now be an endangered species (so much so that Dr. Sinclair Ferguson, who pastored in Glasgow for many years, told me he'd never heard of such a creature). For all this, I can offer no apology. My black goatskin ESV from Allan's is splendid, and the new tan one only gets better. It should be no secret by now that, while I always find something to quibble about, I really like most of the Bibles I write about here. I wouldn't waste time using and photographing and thinking about them if that weren't the case. But I love some more than others, and none more than the Bibles of R. L. Allan's. On this topic, I find it hard to remain objective. I find it hard not to gush. To understand that, you need to know a little history. There is no such thing as the perfect Bible. First there are all those translation options that make it hard to settle on just one. Then, there are the features. And the bindings, of course. The more I see of what's available (and possible), the longer my unattainable list of "must-haves" becomes. But it wasn't always that way. When I first started out, my goal was very simple. I wanted the most flexible, durable edition I could find, because I was tired of treating my Bible with kid gloves just to prevent it from falling apart. At the time, the options seemed much more limited than they are now. From my general interest in fine binding, I knew that bonded leather and genuine leather were not the only options. Cambridge had introduced me to the pleasures of calfskin, but at the time offered nothing in goatskin. At the end of a long, unproductive Internet quest, that included a fair bit of disappointing blind purchases, I finally discovered R. L. Allan and Sons. My first Allan's Bible was a Oxford Brevier Blackface KJV bound in Cape Levant goatskin, and it was a revelation. Much better than the Nelson Signature KJV and even the best Cambridge I had at the time. What I liked about the Allan's edition was that it was both high quality and "old school." 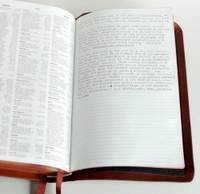 Some high end Bibles -- the ones that use soft, matte-finish calfskin -- look casual, for lack of a better word. They remind me of a Renaissance Festival interpretation of old books. By contrast, my Allan's KJV had a gloss and a level of finish that struck me as more authentic, and certainly a greater pleasure to use. If you've ever handled an Allan's ESV or KJV side-by-side with another high end edition, you'll know just what I mean. Ever since that first goatskin Brevier, I've measured everything against the Allan's standard. Surprisingly few things compare. I'd group Crossway's cordovan calfskin editions up there (provided you get a brown one, not the purplish hue) and the goatskin editions from Cambridge, but not much else. I'm afraid it's not a difference you can see in photos or comprehend through words. You have to feel it, really. I pre-ordered one of the original black goatskin ESVs from Allan's when they were first announced -- which is why the one in the photos is stamped Oxford on the spine (an oversight). Over time, I've had no complaints with the binding. I wish I could monkey around with the interior, transforming it to a single column layout, and additional ribbons wouldn't go amiss, but otherwise I've been entirely pleased. So much so that when the tan version came out, I was able to resist for quite a long time. The edition in the photos is from the latest run of the tan edition. After using it for awhile, I find I really prefer it. A quick run-down of the differences: the new versions now have two ribbons instead of one, and sixteen double-sided lined pages in back for notes. The cover is a mid-tan, with a dark brown lining inside. Otherwise things look the same. Semi-yapp edges, which are those overhangs along the cover that serve to protect the pages. Art-gilt pages -- i.e., red/gold gilt. Both are black-letter Anglicized editions, and apart from that identical inside to the Crossway text blocks American readers will be familiar with. I'm not sure how useful it is to make side-by-side comparisons between the covers, because goatskin is a natural product and you should see variations in every example. But as you can see from the photos, the tan cover has a larger, looser grain than the black. Running my fingertips over the cover, I can feel the grain on the tan, where the black is much smoother. The tan is more pebbled and the black more striated, which gives the black a slightly more refined look. Of course, black is more refined than tan, and that's part of tan's appeal. Like the earlier black edition, the tan is a prodigy of limpness. It feels wonderful in the hand and opens flat like it should. Handling this one alongside the Cambridge Wide Margin NASB reminds me again how much a factor size is in these considerations. 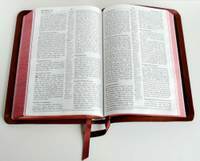 A small Bible, no matter how well bound, is not going to feel as limp or lay as flat as a large one. Genesis and Revelation don't open as wide or stay as flat with the ESV's proportions as they do with the larger wide margin. Still, don't let that detract from your enjoyment. The Allan's ESV starts off excellent and improves with age. The text of the English Standard Version in this edition does not reflect the changes introduced in 2007. According to David Dewey in the comments here, Collins is planning to reprint the Anglicized ESV in May 2008, so I don't expect the updates to appear in an Allan's edition until after that date. If I receive any additional information on this score, I'll pass it along. I would love to see R. L. Allan offer other editions of the English Standard Version, in particular the forthcoming single-column Pocket Reference. For that matter, I'd love to see them do their own versions of every Bible I like -- that's how impressed I am with the quality of their offerings. SO, IT'S A YES, THEN? Absolutely. I know it's hard, given the exchange rate, to visit Bibles-Direct.com and pull the trigger on a Bible sight unseen. In fact, the reason I took photos and posted them with that first review was that, before purchase, I'd never seen a decent picture of an Allan's edition. Hopefully the ones I've included here give you a good idea of what to expect. If you read the ESV and you're looking for the one Bible that will stand up over years of use, this is the one. For that matter, whatever translation you refer, visit the R. L. Allan site and see what's on offer. There's an NRSV bound in goatskin due out this month (October 2007), some pocket-sized TNIVs in goatskin with silk lining -- which I haven't seen but would dearly love to, and a variety of NIVs and KJVs. As I get my hands on more, I'll review them, but in the meantime, I encourage you to discover them for yourself.